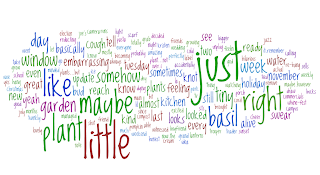 Kim's Kitchen Sink: Wordle. Word. So, I learned about this new thing called Wordle. Actually, it might not be new. I don't actually know. Whatever, the point is that it is cool. You enter text or the URL of website and it crawls it and makes a nifty word-image-thing where the most frequently used words are bigger and the less-used are smaller...I'm sure you've seen things like this before. Lots of people use them for the labels on their blogs (instead of a boring list like I have). Anyway, here's the one I made for my blog, just to test it out. It's pretty neat...you can change the colors and fonts and layout and all that jazz. Nice way to waste time. It's interesting (to me anyway) to see what words I use a lot. You'd think I write about little gardens. Just a little basil to the right. Maybe I do. And just for funsies...here's one I just threw together from Perez Hilton. Ha.